Restructuring your IT support from the ground up is as rewarding as it is daunting, are you ready? The adage isn’t “If it ain’t broke, fix it,” is it? Before you skip ahead to picking and choosing which IT services you want and how they’re managed, pinpoint precisely where your technology is falling behind. 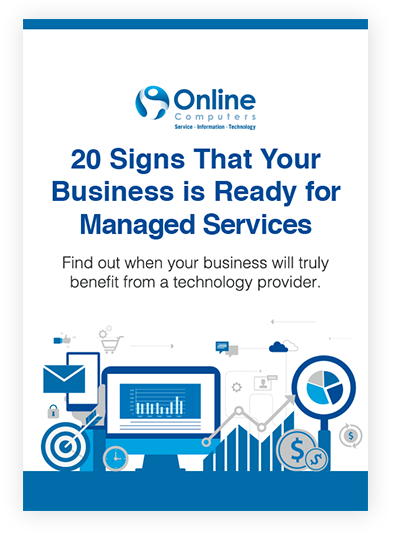 We’re willing to bet our free eBook, 20 Signs That Your Business is Ready for Managed Services, contains at least one observation that describes the problems pestering your business’s IT. By downloading our free eBook, you have zero obligation to Online Computers. Our hope is that by providing you with the information necessary to diagnose your own IT struggles, you’ll remember us when it comes time to select your new technology partner. Until then, enjoy some free advice from the technicians at Online Computers!